Rockford photographer David C. Olson is no stranger to danger, when it comes to photographing wildlife. Follow him on his latest adventure, photographing wild bears in Alaska, and see his breathtaking images. In August 2011, I traveled to a peninsula across the Shelikof Strait, from Kodiak Island, on the southwestern coast of Alaska, with two other photographers. I spent time in two places: Katmai National Park & Preserve, a 4.3-million-acre park, and Lake Clark National Park & Preserve, a 4-million-acre wilderness area accessible only by float plane. The terrain is an irregular coastline framed by rugged peaks and spires, glaciers and snow-clad, active volcanoes. I sought such a remote place in order to photograph North America’s largest land predators, Alaskan brown bears, as they gathered along streams to feast on salmon. 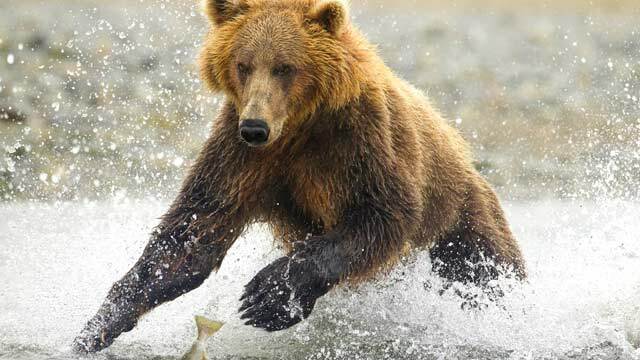 Brown bears and grizzly bears are the same species, but coast-dwelling brown bears are much larger, due to their rich diet of fish. “The great bears that live here are the bears of legends,” I thought to myself, as we landed on the beach of an isolated coastland 3,000 miles from Illinois. People back home had told me I was crazy to place myself in such danger, and I wondered if they were right. After all, I’d be standing face-to-face with 1,200-pound bears that were more than 10 feet tall. I’d been to Alaska seven times, but never this close to giant bears. In this wilderness there were no roads, no man-made trails, no viewing platforms, no cell phones, no electrical wires. Just wilderness and bears, and that’s what made it perfect. It’s possible to find brown bears closer to home, but they’re not of the same disposition as these remote bears who’ve never been hunted or harassed by humans. Bears who’ve learned to fear humans are much more aggressive, and much less likely to go about their normal routines in our presence. As it turned out, the Alaskan brown bears, with their stomachs full of fish during August salmon runs, respected us, just as we respected them. They viewed us neither as a threat nor as their next meal. This is how animals react when they haven’t been harassed by humans. Living in harmony with a large predator requires giving on both ends – what a concept! The bears mostly ignored us, which is exactly what we wanted. Whenever I photograph any animal, I want to be part of the environment, not the object of its attention. A pretty bear relaxes in a field of fireweed (David Olson photo). And so, for 14 days, we lived among the giant bears. We observed and photographed them daily, sometimes spending entire days with a mother and her two cubs. We photographed bears fishing, clamming, grazing, fighting, sleeping, cuddling, nursing and playing. Our closest encounter with a bear was from about 10 feet away. Most of the time, winds were at about 45 mph, and it rained 12 of the 14 days we were there. We’d expected as much from this mercurial region, and therefore carried two of everything – two camera bodies, two sets of gear, and so on. Being without back-up gear in the wilderness can be life-threatening. I knew there would be days of hiking and carrying heavy backpacks with camera gear and tripods, so physical and mental preparation for the trip began months before we left. Mental prep involved knowing how to act and react around bears, how to read their body language. The amazing bears we encountered were smart and gentle by nature, and they lived in harmony with nature. We showed them respect, and they returned the favor. Despite the rain, this was one of the most incredible photography expeditions I’ve ever experienced. We photographed 43 species of birds, whales, seals and sea otters, as well as some of the world’s most breathtaking scenery. In all, I photographed more than 11,000 images of bears and am pleased to share some of my favorites with the readers of Northwest Quarterly Magazine. Make no mistake: photographing bears is a dangerous business. It’s not something that should be done without deep knowledge of animal behavior and wilderness survival. But this trip was an important piece in my lifelong quest to share the natural world with adults and children. I hope that my photography evokes a sense of wonder and awareness about the amazing creatures on this planet. I also hope to evoke action and concern for preserving these wild places and their amazing inhabitants. After all, we don’t protect what we don’t love – and it’s difficult to love what we haven’t known or seen. This wild place is a cornerstone of the planet. Hopefully, it will remain the realm of the great bear. This entry was posted on Monday, March 19th, 2012 at 11:59 am	and is filed under Features, Top Posts. You can follow any responses to this entry through the RSS 2.0 feed. Both comments and pings are currently closed.